I maintain a restaurant wishlist on Urbanspoon which currently stands at 159 restaurants, 99 of which are in the Pittsburgh area. Clearly, it is going to take me a really, really long time to get to them all! So earlier in the summer I created a mental wishlist of the top 5 Pittsburgh eateries I'd like to hit up before the end of the year, and Tamari was one of them. As luck would have it, R.'s step-uncle was in town several weekends ago and staying in Cranberry Township. He wanted to meet up on Sunday, so we met at Tamari's Warrendale location for brunch. Located in the Strayer University complex near where I-79 and I-76 cross over, Tamari occupies a comfortably large space and offers a mouthwatering brunch menu featuring a wide variety of options, including Latino or Asian twists to standard brunch items (e.g., Chorizo Biscuits and Gravy, Bulgogi and Eggs). I, however, had been dying to try Tamari's sushi, so that's exactly what I went for: a Tamari Roll, featuring white tuna, crab meat, a sriracha aioli, topped with scallops, scallions, caviar, and panko flakes. It doesn't look very hefty, but this roll actually has eight pieces, so it is quite filling. I wish I had the stomach space to try another sushi item, because the Tamari Roll was fresh, tasty, and left me wanting for more, but alas, a girl can only eat so much in a single sitting! 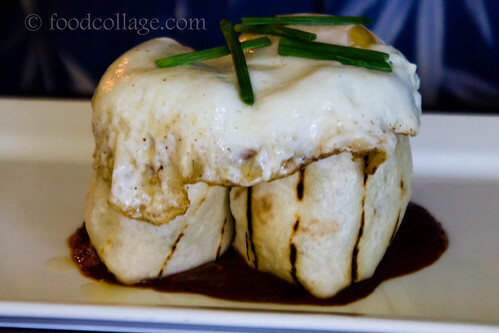 R.'s step-uncle had a Curried Burrito, with pork belly, potato confit, ancho mole, and a fried egg and chives on top. He was nice enough to let me snap a photo and take a bite, too. Delicious! I didn't get a photo of R.'s meal, but he loved it. His Corn Pancakes with ancho syrup and raspberry compote was a "small plate" item, but actually came with three pancakes. We all enjoyed our food and had a lovely time catching up. Ahhh...what more can you ask for? 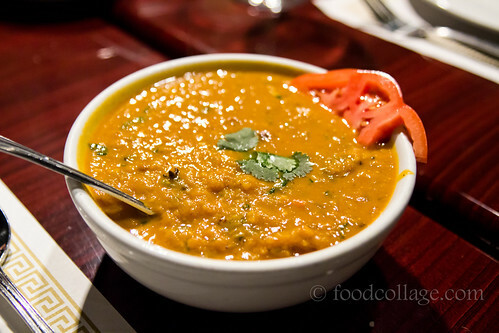 Last month, I attended a FoodBurgh Meetup at Mintt, an Indian restaurant in the South Hills that had come highly recommended to Mike (FoodBurgh blogger and Meetup organizer) by his Indian coworker, and he in turn highly recommended it to his Twitter followers. Now that I've been, I count myself as another patron to highly recommend Mintt. The restaurant did a fine job of accommodating and serving our large group of around 30, even offering us each a glass of complimentary mango lassi (yum!). The service remained friendly and competent throughout the busy evening. The menu looked great and it wasn't an easy decision, but I went with the Goan Shrimp Curry, with a fantastic coconut milk-based sauce and plenty spicy for "medium." In fact, I was surprised by how spicy it was, but at the same time, I appreciated that they didn't dial down the heat for the American tastebud. We washed down our meal with some BYOB beer. There was no corkage fee as far as I remember. The folks sitting near me seemed quite happy with their dishes as well. All in all, it was an enjoyable meal and a fun evening. Several weeks ago we went out with some friends to Teppanyaki Kyoto Restaurant in Highland Park. We had seen some positive press about it and were excited to check it out. The restaurant is easy to miss; I didn't see a sign for the restaurant in the front, so we wandered into the only Japanese restaurant on the block, just about across the street from Park Bruges. Although it has been serving customers for a few months now, Teppanyaki Kyoto Restaurant is still in their soft opening phase as a large part of the space remains under renovation. And despite the restaurant's name, you don't actually get teppanyaki - or what many Americans like to refer to as "hibachi" - here. Nor would you find sushi. Instead, Teppanyaki Kyoto Restaurant specializes in a traditional Japanese pancake called okonomiyaki. We were intrigued by these pancakes, made with wheat flour, eggs, cabbage, and a choice of meat or a combo mix. 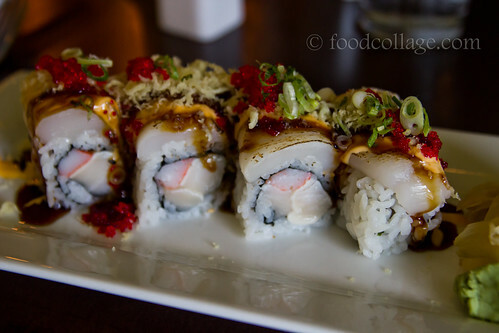 I chose the Hokkaido mix which includes scallops, shrimp, and squid. 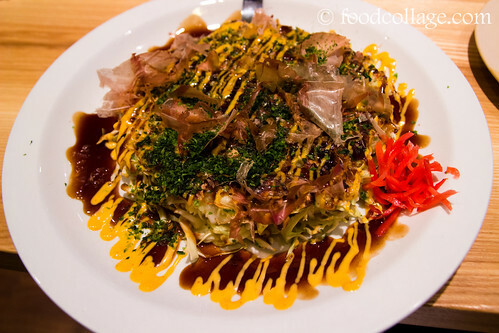 The okonomiyaki is topped with mayo (a choice of regular or spicy), seaweed powder, and...get ready for the coolest part...bonito fish flakes that wave at you. OK, maybe they're not actually waving at you (now that would be a little creepy! ), but they do curl back and forth when they are served as though they are waving hello (to borrow my friend's description). This is apparently caused by the heat from the okonomiyaki itself. The waving does die down as the pancake cools. In any case, the okonomiyaki is quite substantial in size, and delicious to boot! And, lucky for us, it didn't quite take the 25 minutes stated on the menu for the okonomiyaki to be ready. While we waited for our okonomiyaki, we had ordered the fabulous Bacon with Japanese Mochi as an appetizer. 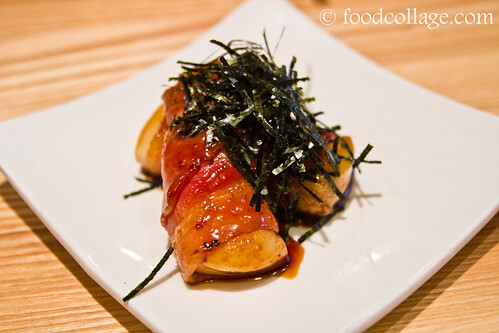 The mochi, which is a Japanese rice cake, is wrapped inside strips of bacon, then topped with shredded seaweed. 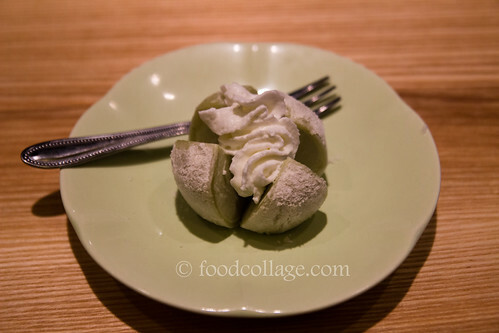 We finished off our meal with a Green Tea Mochi Ice Cream. I have had plenty a green tea ice cream in the past, but Teppanyaki Kyoto's version exuded a unique and lovely Jasmine flavor that I prefer over other varieties. I think it is safe to say that everyone at the table enjoyed our meals, and I think it would also be safe to say that I will be back for sure. Teppanyaki Kyoto is a great addition to the Bryant Street neighborhood; my only wish is that I lived closer!